Bioliquids used in our project include pure plant oil (sunflower), biodiesel (rapeseed ester, neat or blended with fossil diesel), and pyrolysis oil (from pinewood or wheat straw; also neat). Pure plant oil and biodiesel are readily available, whereas in the absence of large production plants, pyrolysis oil is typically produced in smaller quantities (up to a few tonnes). 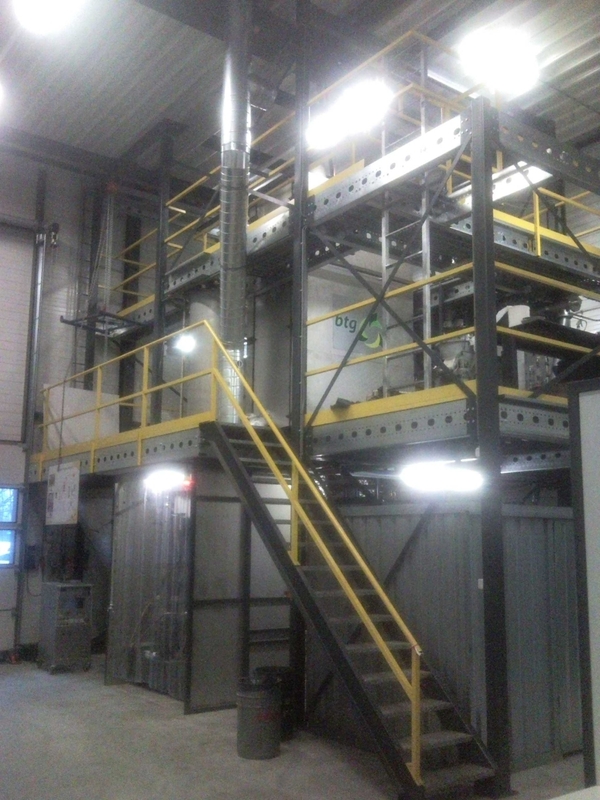 At BTG two pyrolysis units are available for the production of pyrolysis oil: a mini plant (input capacity 2-3 kg/hr) and a pilot plant unit (input capacity 200 kg/hr – opposite left picture). The default feedstock used in the pyrolysis plant is pine; for this project pyrolysis oil will also be produced from wheat straw. Aston University (UAS) has commissioned a 7 kg/hr pyrolysis oil production plant – opposite right picture. In the project first year, the project team agreed on the parameters that need to be analysed within the project. For pyrolysis oil in prime movers, viscosity is an important parameter for atomization. The viscosity has been determined for fossil diesel and for different bioliquids, including pyrolysis oil batches with varying water content. In diagram 1 below the viscosity of the different bioliquids is plotted as a function of temperature. In diagram 2 the effect of water on viscosity is shown. For the characterisation of the properties of bioliquids (including blends and emulsions) a Round Robin is being organised for research laboratories to share experiences, practices and results. This is particularly interesting where Russian laboratories can be involved. 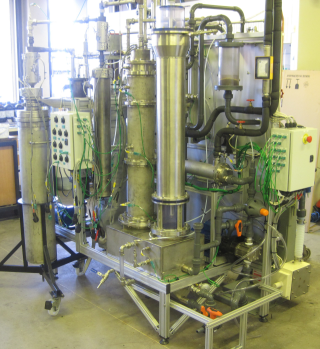 Further catalytic treatment of the pyrolysis oil has been carried out by Boreskov Institute of Catalysis (BIC), and the resulting oil has been tested at the Scientific Autotractor Institute (NAMI) in a 100kWe diesel engine. Emulsions of biodiesel in pyrolysis oil may improve the ignition properties of the latter. The University of Florence (UFL) prepared a state-of-the-art literature review to serve as theoretical basis for the production of emulsions and for their testing in prime movers. Based on this review it was decided to make emulsions of 5% biodiesel and 95% pyrolysis oil.